Something like the Yes Men on Acid. A confidence in their social vision, and the sea they swam in, that allowed them to manipulate the media more than any political groups of the time. What if Occupy converted their camp-outs into theatre? Stop trying to occupy the unoccupiable and seize the imagination! We need more examples of “what could be” than we need more camping space. One could argue that OCCUPY was ( is) theater… just as all political actions could be considered art/theater. And the flip side– all theater is political ! Perhaps OCCUPY was as successful as it was because it did capture the imagination of the masses, and hopes, dreams and fears of action and inaction across generations… Especially when you consider the measure of popular dialogue, it certainly changed the discussion across the board to the economic realities and struggles currently, and pointed out causes that had not been out in public. The living , breathing encampments were, in many cases, rehearsals for another way of living together, based on alternative systems of relationships in comparison to the current societies where they were based. But the camps came with a huge cost– maintenance and community building,particularly, that is very difficult to hold on to in the long haul especially under duress of many kinds ( internal issues and external threats.) So I do support the call for more imagination, continued imagination, of other ways of building the future we’d like to be part of! When I attended my first GA in Montreal, I cried. I had that intense feeling of community and creativity that I remember clearly from the 60s. I completely agree with what you’ve said, but I think they did it by accident. And from my discussions with Occupiers in Toronto, they still don’t understand what they did nor how to convert it to a vision of the future — or use it to overthrow a system they so eloquently described. I definitely think Nadine is right there. The centrality of art in Occupy is/was tremendous. In fact, many have argued that artistic features of the movement were too much emphasized — resulting in its capacity to create a rupture in the public consciousness but not really to fill that rupture with organizing and concerted action. Raging Grannies are a twenty-five year old international phenomenon–not organized, but we do have UNConventions. There are Gaggles in the cities across Canada and the U.S. More in Greece, Japan and Jerusalem and more each week! See us on You-Tube and we are always looking for more outrageous ideas to make a political point. Thanks for reminding us of some of the things we or our contemporaries did in the 70’s. Maybe we’ll re-cycle them!!! Thanks, Nadine. 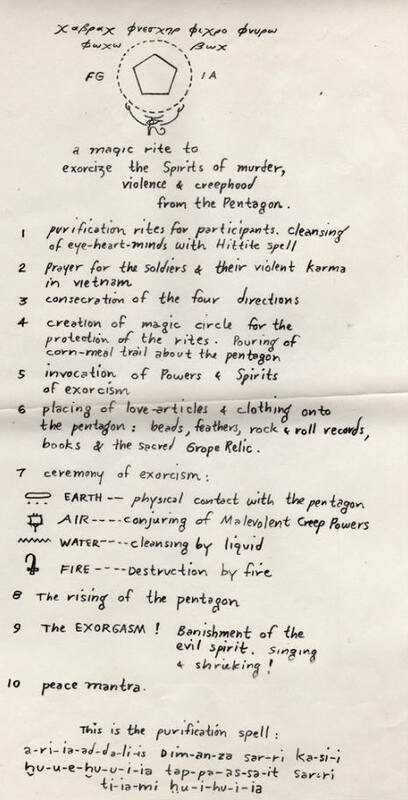 Perhaps the 1967 ritual at the Pentagon actually worked, but in ways that were not immediately obvious. A few years ago I read that the Pentagon—as you point out, the largest office building in the world—is actually sinking. My guess is that Abbie Hoffman’s action loosened up the foundation and is responsible for its gradual descent. But this action probably worked in other ways, too. Tom Wells, in his magisterial study of the anti-Vietnam War movement entitled “The War Within,” highlights how then-Secretary of Defense Robert McNamara was in his office that day and watched the entire proceedings. He is quoted in the book as saying that if he had been in charge of the civil disobedience it would have been much more strategic and effective; I recall him saying that it would could have ended the war! McNamara, of course, came out years later in opposition to the war he prosecuted. Seems that the exorcism worked. Ken, I *love* this comment! Furthermore, I would have to agree that we are not always able to accurately determine what ‘winning’ is, either because of our short-sightedness, our physical limitations to sight/sound, or limited comprehension.. The Vietnam war did end, and not too long after the Levitation– I’m happy to go with your theory. In October 1967, there wasn’t a “typical Washington, DC demonstration”. At the time, the size itself was mind-boggling. By the time of Nixon’s 2nd inauguration, people were used to large DC demos, but not in late 1967. Big Brother’s spying under Obummer and Clinton is 1 million times worse than Nixon ever was. Wake up people! they are the 1% and you are the useful idiots who keep them in power. Hail the King and Queen!